Carry your lunch in style. 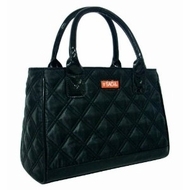 Simple purse like styling features an insulated interior and zipper to keep your lunch fresh and contained. Two side pockets make room for extras.